Enjoy the Video Playlist for some of our 2015 races below. The MSC’s Annual Yearbook, “KNOBBY NEWS” is completed and will be on its way to your mailbox shortly. Start looking the first week of the new year. Inside you will find the Final Championship Points Results for all of the MSC’s Championship Motocross Series Classes for 2015. There are riders listed who were eligible to participate in our contingency programs, banquet sponsors, advertisers who help fund the production of the Knobby News, pictures of all the Champions from each class including the MSC 250 & Open Expert Champion, Davey Sterritt. 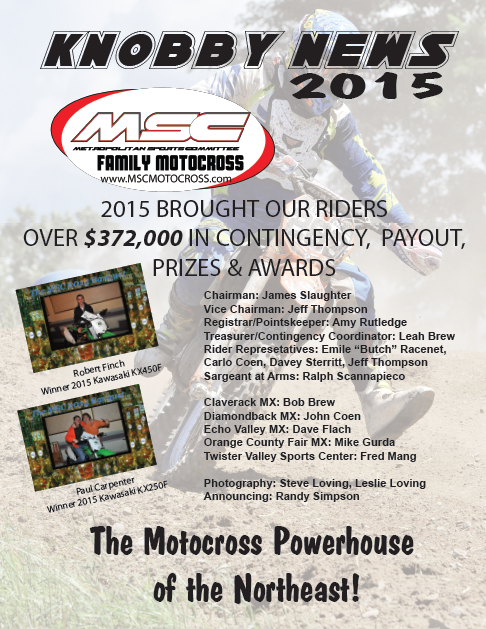 You will find a banquet form and the MSC Rider Registration form back to back. You can tear that sheet out, fill it out, and send it in, all on one page. We are looking forward to seeing everyone at the banquet on February 14th, 2016 at the Hudson Valley Resort in Kerhonkson, NY and of course, we are excited for the 2016 season to be upon us. We hope everyone is enjoying this mild winter, this wonderful holiday season, and we wish everyone a Happy New Year.